Chief deputy Brett from the local sheriffs department offered to take me to a place with old cellar holes dating back to the late 1800s out here in rural Maine. We drove out in his SUV and went up a dirt road as far as it felt safe to go which was over a half mile. Then we hiked in on well traveled ATV trails for another mile on a pleasant warm day in the low 80's. The best spot was this large cellar hole that had had a huge collapsed brick chimney in the center. 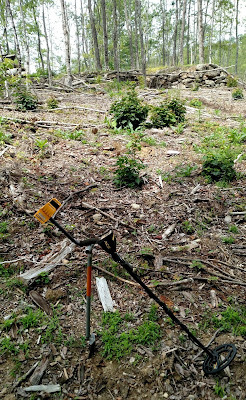 A lot of the surrounding forest had been logged recently, including the area around the cellar. They had marked off the well with orange surveyors tape - it was adjacent to the cellar wall and would be easy to fall in if not marked. There were lots of signals, mostly iron, but also some high numbers. 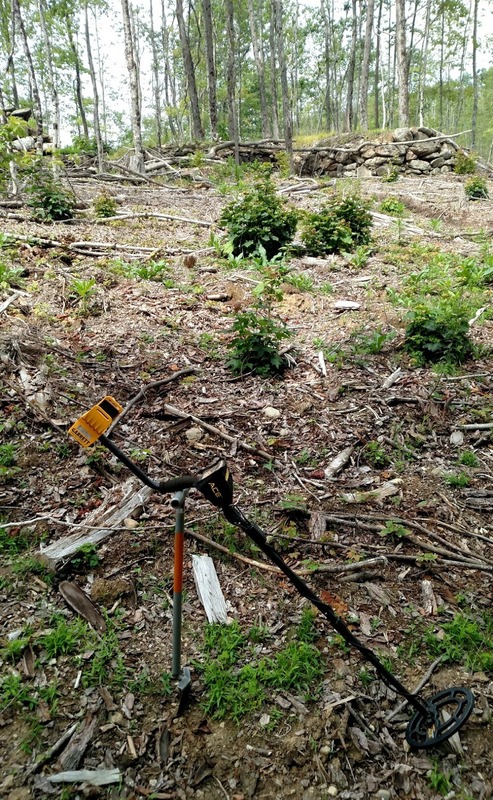 Most signals were so large or deep that I decided not to dig them because I was hoping for coins or buttons. There was also a lot of lead flashing that gave strong signals. We did not spend a lot of time at each of the cellar holes, but I plan to go back when the weather is cooler. 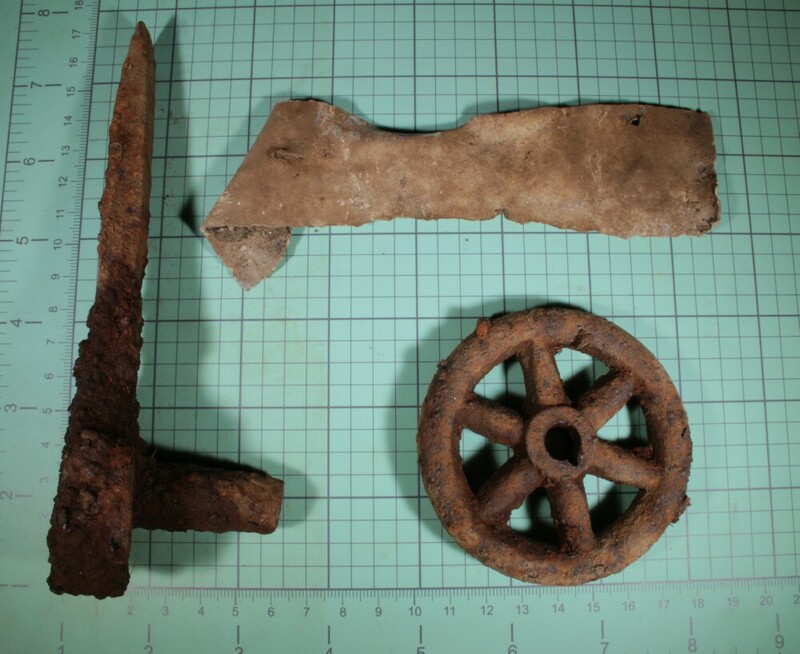 I did find 2 interesting iron objects, one that looks like a valve wheel, and another seem like a wrought iron door handle, plus a sheet of lead flashing. I was often reminded of things I had seen or learned about on the Stealth Diggers YouTube videos. (https://www.youtube.com/user/Stealthdiggers/videos) Those guys are great and very entertaining, while being serious about recovering relics and recording history. We also hauled out some trash including a few beer cans. Leaving it better than we found it. I have this spot pinned on my map for future reference. Lots of potential there! See my next post to learn how I used electrolysis to clean up that wheel.